Your browser does not support this type of video format. Please update your browser. Born from a passion for personalised style and faultless quality; we are committed to the creation of exquisite products that fit and compliment your body shape, as well as communicate a true sense of your personality. In getting to know you, your unique movements and your stance, we are able to ensure that whatever you wear showcases the very best version of you. Nothing says more about who you are, than how you present yourself to the world. We measure. We create. We use the finest materials. We build long-lasting relationships. We break away from tradition and take tailoring into a new era. Be a part of the movement, book an appointment with us today. Colour and personality lie at the heart of Sean Christopher's ethos. Whether it is a unique fabric, or a flash of detail you don't expect, each design is unlike any other. We go beyond tailoring. We also give you stylish accessories to complete you outfit and bring it to life. We know how to do traditional, too. One of our signature styles, this cream jacket showcases our expertise and craft. There's nowhere to hide with simplicity. We'll never limit your possibilities, which is why we pride ourselves on our endless offering of materials, colours, styles and textures - all sourced from the world's best suppliers. Patterns, textures, colours; we pick and choose from a vast array of each to ensure you walk away with the ideal combination for you. The first step is getting to know you, your personality and your movements. What you wear is an expression of who you are, and we’re dedicated to getting it right. Having gained a true understanding of who you are, we’ll work with you to choose the perfect colour and material. Measurement. One of the most important steps in the whole process, we’ll utilise our years of expertise to carefully measure for a product that will sit perfectly on your frame and move flawlessly to your rhythm. Finally, we’ll begin the painstaking production process, all by hand. Give us time, it’ll be worth it. 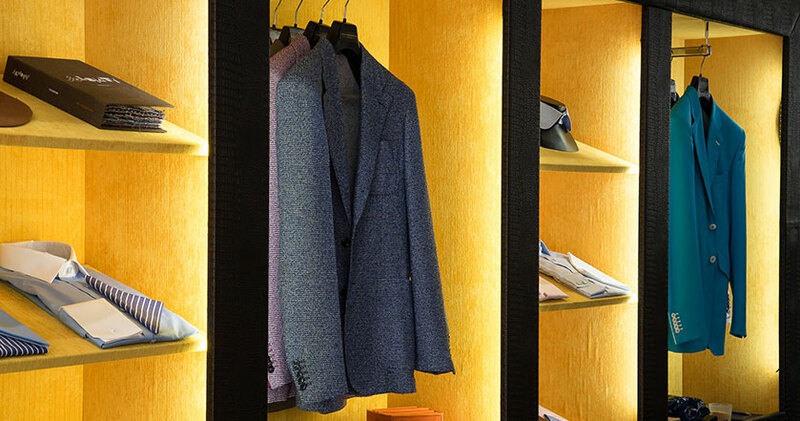 Our intimate flagship store offers a personal shopping experience. With only a select few items available for immediate purchase, our focus is on you, the client, and we’ll take time to get to know who you are and what you’re looking for as soon as you walk through the door. Whilst we accept walk-ins, we would advise booking an appointment to make the most of our time and expertise. Sean Christopher is an expert tailor located in West London. The brand consists of a team of visionaries, creatives and craftsmen committed to providing a quality service without the traditional stuffiness often associated with this luxury fashion process.